This is the story of 35 years old man, Krishna Murari from Allahabad, UP. He reported Dr. Ravi on 14th May 2017 with the complaint of milky white urine and clots. He was constantly losing weight due to protein release through the urine. Sometimes, when he walks for 2 km and if he goes to urinate after walking there is an excess chyle in his urine with clots. The condition gets more complicated when he has to travel. Even he drinks a lot of water to avoid white urine problem but also there is chyle in urine. It made him anxious and worried. He couldn’t understand the problem he was going through. He was under allopathic treatment for 4 months, but there was no improvement in his condition. He came to know about the Dr. Ravi treatment process. 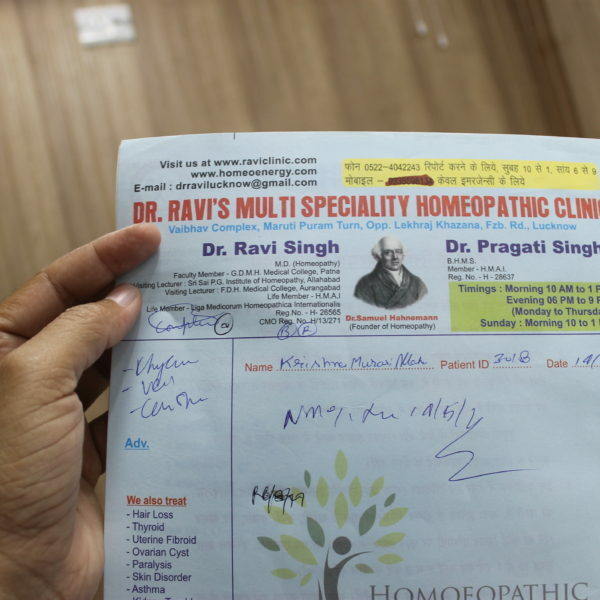 Firstly, he don’t believe but he wants to try it because he has heard so much about the Dr. Ravi treatment process. Dr. Ravi assured him that he will be fine. All he has to do is to take fat restricted diet, avoid curd and exertion because these things can complicate his problem. In his next follow up on 6th August 2017, he reported that he got relief within a week of starting treatment. He couldn’t believe that he can overcome with the problem which cause him so much trouble. He started eating fat, but Dr. Ravi suggested to take a fat-restricted diet for best results. He also reported that once he attended a marriage function in a nearby city and due to traveling and overexertion, next day there was chyle in his urine. Dr. Ravi suggested that to totally get rid of this problem, he should avoid exertion as much as he can. He came for a follow up on 18th Feb 2018 and reported that there was no recurrence of chyle in these 5 months. Previously, while traveling, he had a fear of chyle in urine and he continuously drinks water to avoid it, but then also there was chyle present in his urine. But now, no such problem exists while traveling. He is continuing treatment to avoid any recurrence. When he came for follow up on 19th April 2018, he was happy with Dr. Ravi treatment. He is taking diet with fat in normal life as well as enjoys party food without any tension. Now, there is no fear of chyle recurrence. He had almost forgotten that he was suffering from any such disease. He is totally cured now and he is traveling a lot without facing any recurrence.